Small-scale spine-leaf architecture is a popular IP infrastructure. Courtesy Grass Valley. Today’s smartphone owners carry more powerful video technology in their pockets than the best state-of-the-art TV broadcast or production facilities could provide two decades ago at any price. The second decade of this century is when off-the-shelf computing matures to the point that it can facilitate and manage nearly all technology-based tasks in broadcast TV stations and TV networks in real-time. What are the two most common physical components required for TV production and broadcasting? If you said coaxial cable and duct tape, you’re old-school. Both industry icons are being kicked into retirement by computers. Ethernet cable is replacing coax and Wi-Fi is replacing gaffer tape. Yes, that day is here. Some say digital video began with the need for the digital timebase corrector (TBC) to make video playback from inexpensive, consumer-based, helical-scan VCRs such as the Sony U-Matic meet FCC specs for legal television transmission. The first digital TBCs appeared in the mid-1970s and they worked by storing and substituting a few lines of digitized video to compensate for tape speed and head switching errors. Memory technology soon brought TBCs the ability to digitally store a full 2-field frame which gave birth to frame-syncs, still stores and DDRs. Three months after Steve Jobs unveiled Macintosh and the mouse, Lucasfilm debuted GUI editing at NAB 1984. Trade shows such as NAB and IBC are often characterized as milestone events by the debut of a wildly successful product. Every once in a while, a milestone is a landmark. In 1984, Steve Jobs introduced the first Macintosh and Lucasfilm spinoff EditDroid introduced a landmark digital editing product that was the buzz of NAB. It used LaserDiscs for storage, making it faster than linear videotape to locate clips. It had a timeline GUI to mark edits with trackball controller and was way ahead of the first 128k Mac. It was pricey, but it gave many video dreamers new ideas. Only 24 EditDroids were made and fewer were sold, so it never became a milestone product. But, it’s a landmark because its concept set the course the industry continues on to this day. Five years after EditDroid demonstrated it was possible, a Macintosh and mouse-based Avid/1 computer video editor debuted at NAB and it became a 1989 milestone. Avid acquired EditDroid software rights in 1993 and essentially retired it. Video on computers has long been the ambition of many video dreamers. It took mainstream personal computer technology a couple of decades to master standard-definition video live production, storage and playback. Quality and bandwidth have since become moving targets and technology has caught up and is moving faster, literally. Live video over IP isn’t new. There are many options for moving live video over IP. Most involve various degrees of compression and latency due to bandwidth restrictions and processing, sometimes known as bottlenecks. Broadcasters don’t make excuses. No excuses means no hiccups, no discrepancies. There’s a new wave of hardware that can keep up with a multi-channel, high-definition broadcaster’s zero-compression, zero-latency, zero-discrepancies demands. The latest off-the-shelf networking and computer technology not only eliminates digital bottlenecks, it does the exact opposite. The backbone of SDI’s predicted replacement is 10-Gigabit Ethernet (10GbE). Over copper, 10GbE needs Cat 6A or better cables and connectors specified to at least 500MHz. Standard Cat 6 cables and connectors are designed for up to 250MHz. Cat 5 is good to 100MHz. 10GbE connections can also be fiber. Be aware that 100GbE switches are waiting for computers to catch up and broadcasters will probably be some of the first to take advantage of it. Affordable 10GbE switches, such as this Netgear ProSAFE XS708E, are widely available and inexpensive. The video latency of 10GbE is measured in video lines. It interfaces with the universal infinite router, the Internet, at speeds of 1 GB or more available to some today and more tomorrow. The 10GbE economy-of-scale is exemplified by 10GbE prices on many Internet shopping sites. The challenge is finding useful production gear that can leverage gigabit speeds into benefits for owners, producers and viewers. Guess what's coming to NAB. The migration from SDI to IP is one of the greatest broadcast technology innovation waves yet. Broadcast product IP migration is being enabled with new technology, some outboard, some built-in. SMPTE tossed a rock in the IP video pond with its first version of SMPTE 2022 in 2007. Ahead of its time, the ripple defined an interoperability standard to translate uncompressed 1080p signals to IP communications between different manufacturers gear using the standard. The latest version is last year’s SMPTE 2022-6. Several major industry names introduced SMPTE 2022-6 gear at IBC 2015, including Harmonic, Imagine Communications, Grass Valley and EVS. The SDI to IP transition was the topic de jour at the recent IBC and sure to make NAB ’16 a landmark among milestones. IP video isn’t new, but universally expanding IP pipes is making IP a more realistic live alternative to SDI. Curiously, Grass Valley owner Belden makes the heavy coaxial cable used for SDI. Of course, Belden also manufactures computer Ethernet cables, and gear that uses both. Grass Valley adopted SMPTE 2022-6 and has been working on IP prototypes with customers under non-disclosure agreements for about three years. During that time, product feature sets were proposed, designed and modified. The GV Node is a SDI replacement that takes full advantage of 10GbE and SMPTE 2022-6. Hilton said the result was “a new product family representing the merge of four products.” The new GV Node product is a hybrid A/V router, IP aggregator, a digital video processor and a multiviewer, in a modular form that is fully compatible and fits in a GV Densité frame. “What makes it unique in IP is that all switching occurs during the vertical interval,” Hilton said. “It’s far more than a x86 solution. It’s a terabit switch with 12, 40 GB/s connections at 480 GB/s in and 480 GB/s out per GV Node, allowing it to interconnect to other GV Nodes or Commercial IP Switches without blocking any signals across the links.” GV expects the Node to begin shipping at year’s end. Not everyone has jumped on-board with 2022-6 for a variety of reasons. One is that uncompressed 4K UHD requires approximately 12 GB and 2022-6 tops out at 10 GB. Who wants to bet 4K isn’t coming? Anyone? There are several new compression schemes under development by various groups and alliances to close the 2 GB UHD gap. Most will require a royalty payment. Some purists will claim to see compression artifacts. The standard almost seems to have temporarily painted itself into a UHD technology stalemate similar to ATSC 3.0. Another issue is that royalties add to the cost of each device. Other manufacturers and groups are looking at different ideas to accomplish a similar goal. NewTek’s NDI GigE will soon be available royalty-free to anyone who wants to use it. In the week leading up to IBC 2015, NewTek announced its Network Device Interface (NDI), an open standard for live production workflow over GigE. Its encoding algorithm is resolution and frame-rate independent, supporting 4K (and beyond) along with 16 channels (and more) of floating-point audio. NDI connectivity will be available in Q4 as a royalty free software developer kit (SDK) for anyone wanting to enable IP workflows in their facilities, or in production devices and systems they manufacture. It allows multiple video systems to identify and communicate with each other over IP, and to encode, transmit and receive many streams of high quality, low latency, frame-accurate video and audio in real-time. The NDI system uses a GigE local area network to move and integrate data, commands and live content. It is a bi-directional standard that can operate over a GigE local area network, with many video streams on a shared connection. The protocol also includes tools that implement video access rights, grouping, bi-direction metadata and IP commands. NewTek collaborated with AJA, Deltacast and Matrox to enable their capture cards to act as NDI senders or receivers. 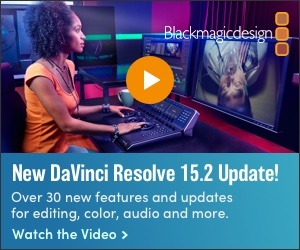 Support for Blackmagic Design cards will also be provided. Many companies such as PlayBox Technology, Teradek, Vizrt and Wasp3D will be NDI-enabled the day of the launch. Many others, such as Boland, JVC, LiveU, NewsMaker, Panasonic, PESA, Sienna, and Wowza are all working on providing NDI-based solutions. In terms of video maturity, the state of Gigabit and 10GbE video over IP networking is somewhere between crawling and learning to walk. Will 1/10/100 GB/s change the industry? Will it obsolete coaxial SDI? The answer is probably yes, until something better comes along. Broadcast video technology is advancing so fast it makes declaring the best time to drop anchor confounding. Some facilities are quietly planning to skip 4K in anticipation of adopting 8K. Will 8K be the end of the resolution road or is that idea about as likely a jackpot on a Las Vegas airport slot machine? This much we do know. The economy-of-scale and the fact that computing technology continues accelerating towards better, faster and cheaper is literally turning the broadcast hardware industry into ether. Is software-based broadcasting the next big thing or just another step along a confusing digital evolution path? Nobody will know for sure until sales trends are reported.